I see it at project level. Is it also applicable at organizational level? What do I get from implementing Kanban? These are some of the questions about Kanban that I am asked by people who consider getting started with Kanban in their teams. Here I try to summarize my understanding of the Kanban method. Let’s start from the context to which the method applies, an organization. Typically it is an organization that develops software products or IT services. The organization is a system. The operation of this system depends on the characteristics of its customers/ the market it works for, the established processes and policies, the people doing the work, their skills and knowledge levels, as well as the technologies and the tools used. Therefore, we represent these factors as inputs to the system. On the other hand, the outcomes of the system are the products and services developed, together with the defects and other waste (paperwork, coordination meetings with no results achieved, etc.) created. We try to keep the latter to a minimum. One way to measure the level of performance and agility of a system is through the indicators of efficiency and performance. Both, the deliverable results and the level of system performance depend on the proper management of input factors. Naturally, we want to increase the positive results and reduce the negative ones for the business to be profitable, sustainable and continuously improving. The proper management of a system requires a good understanding of its components and a set of principles and values to guide the decision making. 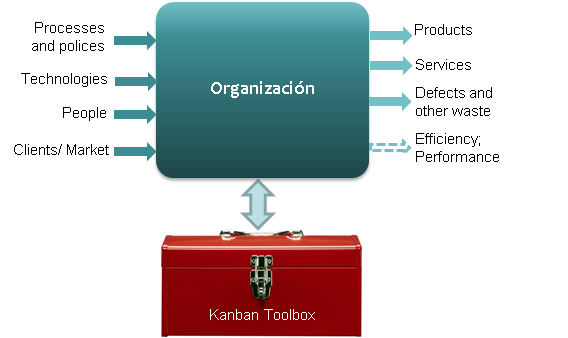 Kanban is the toolbox necessary for the successful evolution of an ICT organization. 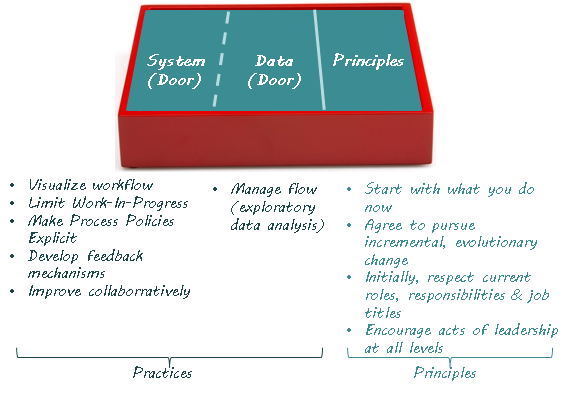 The “tools” included in the Kanban Toolbox allow understanding the context and the functioning of the organization by analyzing its system- and data aspects (in Six Sigma known as System Door and Data Door). Also, as every good toolkit, it provides the guidelines for handling the work on the system. More precisely, in the “suitcase”, we have the practices and the principles of Kanban that facilitate driving an organization towards its goals of better efficiency and performance. With respect to Kanban values, I recommend you Mike Burrows’ post “Introducing Kanban through its values”. Kanban works on the processes of the organization, but in itself it is not a process. Kanban helps developing an agile and lean business. Why should I care about Kanban?